Halloween has come and gone and while my kids are still happy with their candy gains, I find myself a bit sad. For the past few months, I had been planning my fez and bow tie crafting projects. I researched options, printed out patterns, bought materials, and spent time cutting, sewing, and hot gluing the pieces into place. I even had to make some judgment calls when my available supplies didn’t match what was called for. (Why must bow tie clips be so hard to find in local stores?!!) 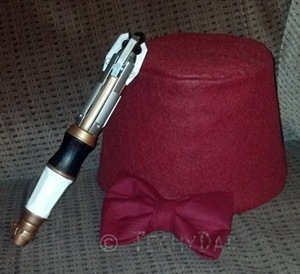 In the end, I had a very nice fez and bow tie set. They are – to quote Matt Smith’s Doctor – cool. Beyond repeating these projects, though, I’d like to try something new. Perhaps I’ll make my boys some Teenage Mutant Ninja Turtles hats. Or maybe I’ll seek out some TARDIS pillow or blanket instructions. I might even try making an Adipose. And this reminds me that I have a baby quilt to work on….